Here is a novel seating idea for your home - our raised panel sleigh seat. The perfect addition to a home that already has a sleigh-style theme going on, or more than capable of making a statement all by itself. Added to your sleigh style bedroom, it gives you a place to sit while you are putting on your shoes or socks (or, in the case of the webmaster’s house, a place to pile laundry!). You could also use it for hall seating, in the entryway, dining room, or any place else you would like to carry the sleigh theme into your home. 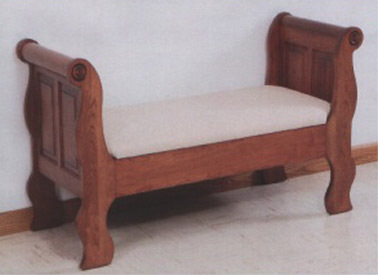 Made by the Amish, of course, you may order your raised panel sleigh seat in either solid oak or cherry..Please note that the cushion shown on this item is sold separately.